Sign up now and get free shipping on all auto-shipped orders! Worried about committing to automatic shipments? Don't be! Call us anytime to change your shipment date, shipment frequency, and even the products in your order! We can accommodate any schedule, no matter how often it changes. Don't let inflation affect you! We all know cost of living fluctuates with the economy, and prices tend to go up over time. 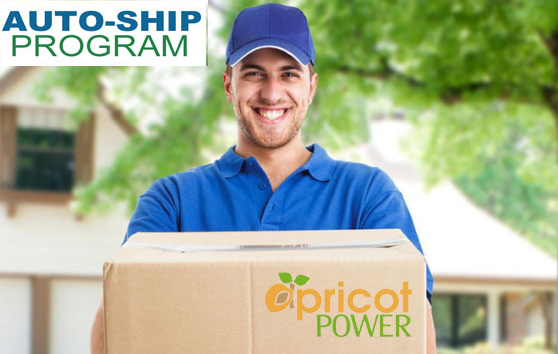 At Apricot Power, we do our very best to keep these changes from affecting our customers, but once in a great while we do find ourselves needing to raise prices to so that we can continue to provide you with quality products for many, many years to come. However, when you sign up for auto-ship, we promise you that the price you pay today is locked in for as long as you have your auto-ship with us, regardless of changes in market prices. What if the price of a product goes below your locked-in price? Your price will automatically drop down to meet the sale price for as long as the sale lasts, then it will go back to your locked price when it becomes the best price available once more! You don't need to place an order to sign up for auto-ship. We can set the first shipment to go out whenever you want - sign up now for the special pricing and have it shipped when YOU are ready. Call us at 866-468-7487 now to get started or select your products and choose auto-shipment at the bottom of the cart page online. *Offer not currently applicable for wholesale accounts.